1. Please allow at least 24 hours for your floor to dry. 2. We do not recommend any throw rugs for at least 2 weeks while your floor cures. 3. Animal traffic should be kept to a minimum for two weeks. 4. Furniture may be replaced (not dragged) after 24 hours. For best results use felt pads. Please do not use any other chemicals on your floors. If you develop wear patterns in your floors over the years we can screen and coat your floors. A screen and coat brings back the luster of your floor without the actual sanding, ONLY if your floors are maintained properly. The biggest threat to hardwood flooring is dirt and grit that gets ground into the surface of the finish, causing ugly scratches and a worn finish. 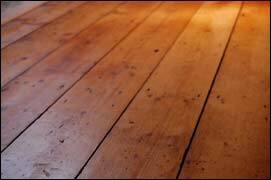 If the floor is abused or left unattended, dirt will become imbedded into the unprotected surface of the wood, making ugly dark areas within the floor. On average, homeowners re-coat their wood floors every 15 to 25 years, to make them look brand new again. To make the finish look and last the longest, it is recommended to sweep up dirt and grit off the hardwood floor weekly using a swiffer to prevent scratching. Using the wrong cleaner can damage the finish and cause premature fading. Prevention is key when it comes to safeguarding your new hardwood floor. Use doormats at all entrances from outside to trap dirt before it has a chance to reach hardwood. If you have pets, especially big dogs that run in the home, make sure nails are trimmed and accidents are cleaned up immediately. Make sure you apply felt pad glides to furniture legs. You can find a variety of sizes and colors to fit your needs at your hardware store. Avoid moving large/heavy furniture/appliances by dragging them on hardwood flooring. Spiked/stiletto heeled shoes are also a danger to hardwood flooring; some can even cause dimples in the surface of the wood. Never Use: Furniture Polish, Wax-Based products, Detergents, Bleach, Polishes, Oil Soaps, Abrasive products to clean hardwood flooring. Too much water can seep into the seams of the wood causing delamination of the finish, cupping of the edges of the boards and discoloration of the wood itself. Spills should be wiped up right away. Liquid spills left standing on hardwood flooring can seep into wood through the seams and will result in problems like warping and buckling boards. There are specially designed mops which feature reusable cloth covers. These are perfect for picking up dust around corners of your room and won't harm you new hardwood floors. When your new hardwood floor is in need of a more thorough cleaning, it's best to use a dampen a string mop with water and a splash of vinegar.